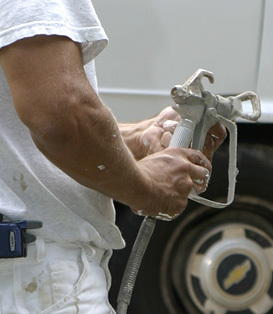 Jim's Painting, Inc. - Residential and Commercial Painting Contractors servicing the metro Atlanta area of Georgia. Working in commercial and residential housing, Jim's Painting, Inc. provides exterior and interior custom painting, pressure washing, dock and deck restoration, trim repair, and much more. We use the finest paints and stains manufactured by famous brands such as Sherwin-Williams, Duron, and Porter. Our policy is to keep you as our customer, so you will never have to redo any job that has been done by Jim. © 2006 Jim's Painting, Inc. All rights reserved.